var lastPromise = WinJS.Promise.wrap(); // Start with an empty fulfilled promise. // Don't call directly so next promise doesn't get previous result parameter. The only thing to watch out for is to ensure you don't pass the result of a previous promise onto a subsequent promise that is unrelated. This solves the problem but puts a lot of work on the caller who may not notice nor follow this requirement. To ensure I'm acting upon my own messages and not messages that happen to have similar properties as my own, I place a 'type' property on my postMessage data with a value of a URN unique to me and my JS library. Usually because its easy I use a UUID URN. There's no way someone will coincidentally produce this same URN. With this I can be sure I'm not processing someone else's messages. Of course there's no way to modify my postMessage data to prevent another library from accidentally processing my messages as their own. I can only hope they take similar steps as this and see that my messages are not their own. I can also make my own unique MessagePort for which only my library will have the end points. This does still require the caller to provide an initial message channel over which I can communicate my new unique MessagePort which means I still have the problems above. However it clearly reduces the surface area of the problem since I only need once message to communicate the new MessagePort. The best solution is likely all of the above. Photo is Sharing by leezie5. 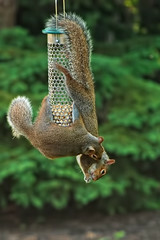 Two squirrels sharing food hanging from a bird feeder. Used under Creative Commons license Attribution-NonCommercial-NoDerivs 2.0 Generic. My second completed app for the Windows Store was Words with Hints a companion to Words with Friends or other Scrabble like games that gives you *ahem* hints. You provide your tiles and optionally letters placed in a line on the board and Words with Hints gives you word options. I wrote this the first time by building a regular expression to check against my dictionary of words which made for a slow app on the Surface. In subsequent release of the app I now spawn four web workers (one for each of the Surface's cores) each with its own fourth of my dictionary. Each fourth of the dictionary is a trie which makes it easy for me to discard whole chunks of possible combinations of Scrabble letters as I walk the tree of possibilities. To handle the bother of postMessage communication and web workers this was the first app in which I used my promise MessagePort project which I'll discuss more in the future. This is the first app in which I used the Microsoft Ad SDK. It was difficult to find the install for the SDK and difficult to use their website, but once setup, the Ad SDK was easy to import into VS and easy to use in my app. The parent starts the communication posting to the worker. The worker sets up its message handler in its first synchronous block of execution. [html5] Web Workers: Race-Condition setting onmessage handler?